Bedford Eye Care News: What Big Eyes You Have, Dear, but Are Those Contacts Risky? Of all the strange outfits and accessories Lady Gaga wore in her “Bad Romance” video, who would have guessed that the look that would catch fire would be the huge anime-style eyes she flashed in the bathtub? Lady Gaga’s wider-than-life eyes were most likely generated by a computer, but teenagers and young women nationwide have been copying them with special contact lenses imported from Asia. Known as circle lenses, these are colored contacts — sometimes in weird shades like violet and pink — that make the eyes appear larger because they cover not just the iris, as normal lenses do, but also part of the whites. “I’ve noticed a lot of girls in my town have started to wear them a lot,” said Melody Vue, a 16-year-old in Morganton, N.C., who owns 22 pairs and wears them regularly. She said her friends tended to wear circle lenses for their Facebook photos. These lenses might be just another beauty fad if not for the facts that they are contraband and that eye doctors express grave concern over them. It is illegal in the United States to sell any contact lenses — corrective or cosmetic — without a prescription, and no major maker of contact lenses in the United States currently sells circle lenses. Yet the lenses are widely available online, typically for $20 to $30 a pair, both in prescription strengths and purely decorative. On message boards and in YouTube videos, young women and teenage girls have been spreading the word about where to buy them. Ms. Kim, who lives in San Francisco and is 31, said that some friends her age wear circle lenses almost every day. “It’s like wearing mascara or eyeliner,” she said. Sites that sell contact lenses approved by the Food and Drug Administration are supposed to verify customers’ prescriptions with their eye doctors. 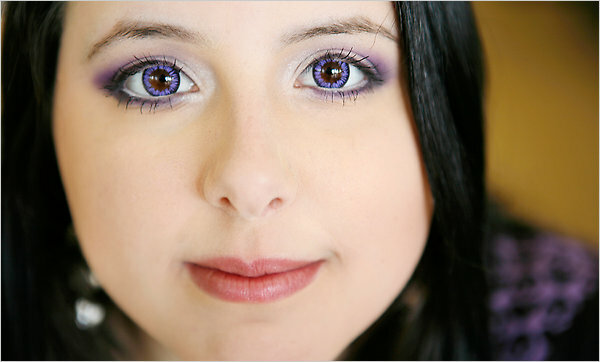 By contrast, circle lens Web sites allow customers to choose the strength of their lenses as freely as their color. Ms. Rowland has a part-time job at a Waldbaum’s supermarket, where customers sometimes tell her, “Your eyes look huge today,” she said. Even her manager expressed curiosity, asking, “Where did you get those things?” she said. Karen Riley, a spokeswoman for the F.D.A., was a bit surprised, too. When first contacted last month, she did not know what circle lenses were or the extent to which they had caught on. Soon after, she wrote in an e-mail message, “Consumers risk significant eye injuries — even blindness” when they buy contact lenses without a valid prescription or help from an eye professional. Dr. S. Barry Eiden, an optometrist in Deerfield, Ill., who is chairman of the contact lens and cornea section of the American Optometric Association, said that people selling circle lenses online “are encouraging the avoidance of professional care.” He warned that ill-fitting contact lenses could deprive the eye of oxygen and cause serious vision problems. “What made me comfortable is so many girls out there wearing them,” Ms. Nguyen said. A makeup artist named Michelle Phan introduced many Americans to circle lenses through a video tutorial on YouTube, where she demonstrates how to get “crazy, googly Lady Gaga eyes.” Ms. Phan’s video, called “Lady Gaga Bad Romance Look,” has been viewed more than 9.4 million times. These days girls of many races are embracing the look. “Circle lenses are not just for Asian people,” said Crystal Ezeoke, 17, a second-generation Nigerian from Lewisville, Tex. In videos she posts to YouTube, Ms. Ezeoke’s gray lenses make her eyes look an otherworldly blue. Jason Aw, an owner of PinkyParadise.com, a site based in Malaysia, is well aware that his shipments to the United States are illegal. But he is convinced that his circle lenses are “safe; that is why a lot of customers will recommend” them to others. His “job,” he wrote in an e-mail message, is “to provide a platform” for people who want to buy the lenses but cannot do so locally. Girls like Ms. Vue, the 16-year-old in North Carolina, help steer customers to sites where circle lenses are sold. She has posted 13 reviews of circle lenses on YouTube, enough to merit her a coupon code at tokioshine.com, which gives her viewers 10 percent off. “I have been getting tons of messages asking where to get circle lenses, so this is finally a legitimate answer for you,” she said in a recent video. Ms. Vue was 14 when she begged her parents to get her first pair, she said. These days, however, she is having second thoughts about them — but not for health or safety reasons. Circle lenses have just grown too popular, Ms. Vue said. “It kind of makes me not want to wear them anymore, because everyone is wearing them,” she said. There's nothing wrong with jiving into new fashion trends. But we have to be careful with buying products. My sister also wants to have those cosmetic lenses. We are so worried about her eyes' health because she has astigmatism that's why mom didn't allow her to buy non-prescribed lenses. Last week, they went to one of the professional optometrists (Indianapolis, IN-based) to check her eyes' condition. My sister still wanted to have circle-eyed lenses so she asked one of the optometrists in Indianapolis if it safe for her to wear lenses. Her optometrist allowed her to wear lenses and advised her to choose prescribed ones only.